Booking a destination wedding can seem like a daunting, complicated task. 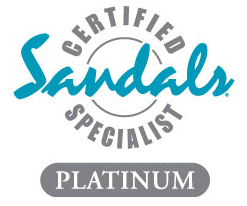 But, Sandals WeddingMoons have made destination wedding and honeymoons as easy as counting to four. In four simple steps, the exhausting, tedious planning of your wedding and honeymoon are done. And, all with unprecedented level of luxury and perfection. Laid-back Jamaica? Romantic Antigua? Adventurous Bahamas? Whatever style you’re envisioning your wedding to be, Sandals offers 15 unique resorts spread across 6 different islands to fit your unique lifestyle. If you’re not sure, we’re more than happy to provide our insight on each of the resorts and the different experiences that you’ll find there. Lisa has been to all 15, in fact! Our expertise and close relationship with Sandals Resorts means that we know each property well and can make the best recommendation for each couple that comes to us (and VIP each and every one). Ready…set…WeddingMoon! What to expect? What is the resort really like? Find out firsthand with an optional 2 night stay at your ideal property, starting at a rate of only $250 per night. This glimpse into your special life event is sure to inspire and reward you. When you book a WeddingMoon group of 10 rooms or more after your Test Drive, you’ll receive up to $2,200 in credits towards planning the wedding! When you’ve found your slice of paradise to say “I Do” in, the next step is securing your spot there. We’ll help you choose the perfect room category to go with your chosen wedding date and time. And, if you stay for 3 nights or more, your Beautiful Beginnings wedding is free! You can fully customize your wedding beyond this package, from color palette to cake to venue. You can also choose from one of the pre-designed wedding themes if you don’t have any specific ideas in mind. Either way, you’ll have us and your complimentary wedding planner on-resort to help you get the details just right before you arrive for the big day. Step 4: Send out the Save-the-Dates! Let us take care of organizing your family and friends. Once we have your wedding date secured, we’ll work with you to decide how you want to plan your group reservation. We can even set up a registry for those that love you to donate to your WeddingMoon. This leaves you to focus on dress shopping and gazing at your sparkly ring while we handle booking your family and friends for your wedding in paradise!